Set in the late 1800's a small group of people board a night train to Atlanta. Ex-slave Jericho Whitfield (Tony Todd) witnessed his daughter get scalped by his last master and is now on a killing spree to murder and scalp all slave masters and their children . He has his sights set on Annie Hargraves (Jennifer Laporte) the daughter of his last master who also happens to be on the same train. Her wealthy father has hired protection for Annie who although probably perfectly capable of looking after herself has mercenary Roland Bursley (Michael Eklund) to shield her from Jericho's attempts. All that becomes rather irrelevant when an evil presence makes itself known to all on the train. 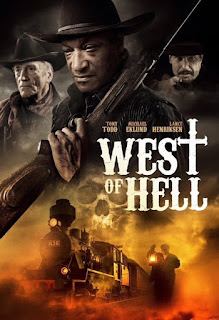 The Devil himself (Lance Henriksen) then arrives to judge them all and decide their fate in hell. The other passengers aboard have all been selected due to their behaviour and it is up to them to figure out exactly why they are all destined to meet with an eternity languishing as tortured souls in the fiery depths. This seems to have been received by some terrible reviews so I feel the need to stick up for it a bit. I actually found this quite an entertaining supernatural Western. Great to see Tony Todd in a lead role, I really enjoyed his performance. Lance Henriksen on the other hand maybe didn't do as great a job but I will let him off for now as he was kind of creepy. Many other cast members were great too. I really liked Jennifer Laporte as Annie and it was good to see Jeryl Prescott (The Walking Dead) as the meek and oppressed Desdemona Lark . Co writer Yousef Abu-Taleb plays Father Locke who has the best departure and I loved the character of Mr. Braxton (Richard Riehle) the sinister train conductor. There are a couple of downsides however, regardless of the impressive acting this is very cliche with bangs and bumps designed to make you jump yet fall short more often then not. The soundtrack is really odd as well. For the most part it is fine and fitting with everything that is going on onscreen apart from one particular fight sequence quite near the start that seems to have the wrong kind of music playing over it. There is not much in the way of effects but some alright kills and a bit of blood. The plot isn't going to break any boundaries and it wasn't exactly scary but it didn't seem to me to be anywhere near as bad as some have made it out to be.